Y ya tengo el resultado del sorteo del vestido….y la ganadora es…. 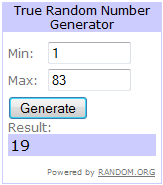 I already have the result of the dress giveaway…and the winner is…. que linda tu mochila, y me encanta tu estilo tan relax! aunque me diste frioo xD! haha besos! Te quedo precioso el pañuelo! Los colores de esa tela estan divinos! The scarf is beautiful! I love the colors!!! Looks great on you. 🙂 And you made it! So talented! Me gusta el pañuelo, sobretodo la mochila! The scarf looks fabulous- the perfect touch of colour! Me encanta tu look eres muy guapa! That scarf is really cool! Love it! aww que emocion! Cómo puedo hacer ahora para recoger el vestido 🙂 ? Great head piece!!! very Hippy-ish like and very bohemian feel 🙂 love!!!! im inspired! Hello there sweetie! Thanks for all lovely comments over my blogs, it means a lot to me! The contest is to win a trip in Australia, the chances for me to win are really low because I entered really late but is fun! Thanks for the comment there 2! I’m in Tirana, the new house is really cute. I unpacked my clothes but still we are waiting for our beds! I’m staying at my aunt’s house, they are on a trip in Italy and here I have free wireless! The post is great, love your style girl! woooooooooo amé la mochilita, es tan perfecta. y el pañielo esta precioso!.. i love these items, and i love your awesome blog too! hi. thanks for visiting my blog. anyway, I’m loving your style and your choice of clothes! Muy lindo pañuelo, genial el outfit y me enamoré de la mochila! Besazo linda!! Cute! I love how you tied that bright scarf. Wauww lovely, great job!!! We love itt! Super look!!! J aime beaucoup cette écharpe!!! The colors of the scarf are really nice. Me encantan los colores del pañuelo! you have wonderful style! that scarf is awesome! I love your look, You look so fab and cool. and congratulations to the winner. Love the head scarf! So cool that you made it yourself! love this outfit. the shorts with the black tights and combat boots are fab! i also love how you tied that scarf around your head! LOVE the head scarf and that backpack! También podría hacer un turbante con el pañuelo, saludos! Love this, your head scarf is awesome! I love the gypsy look ! Looks really good with your dark hair.